But, New York is spread out over a dozen islands. Manhattan, Staten and Long Island are but three of them. On this Forgotten page we’ll take a look at some of the islands that make up New York City, and the lore behind them. 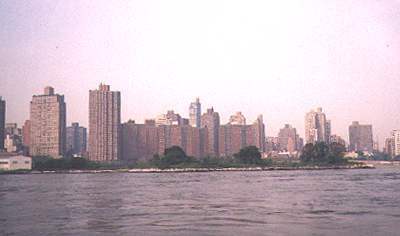 In the summer of 2000 your webmaster took a boat ride in New York harbor sponsored by the Brooklyn Center for the Urban Environment; along the way, we saw New York City as it’s rarely seen and got pictures of some of the islands of the harbor close-up. Here our vessel prepares to pass beneath the 59th Street/Queensboro Bridge. This is the ancient Smallpox Hospital on the southern tip of Roosevelt Island, contrasted with the gleaming new Citicorp Tower of Long Island City, the tallest structure on Long Island. It was built by architect James Renwick Jr. between 1854 and 1856; it was probably as eerie even when it was in use. 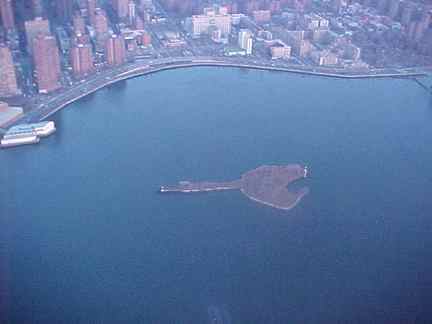 This aerial view of Roosevelt (formerly Welfare, formerly Blackwells) Island is shot looking south. 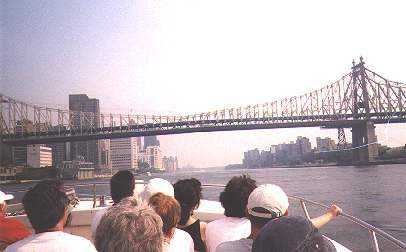 The bridge in the foreground connects it to Astoria; the Queensboro Bridge is in the background. Roosevelt Island has been home to asylums and hospitals for most of NYC’s history. Since the mid-70s, it has been home to a residential development first envisioned by famed architect Philip Johnson. North and South Brother Island are in the East River, between Port Morris in the Bronx and the much larger Riker’s Island to the east. 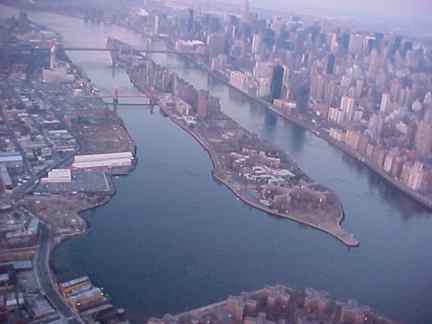 Though both islands are currently in the Bronx, South Brother belonged to Queens as recently as 1964. The larger of the two, North Brother, was used for penitentiaries, asylums and dumping grounds for society’s ‘undesirables,’ like Roosevelt Island, for decades. 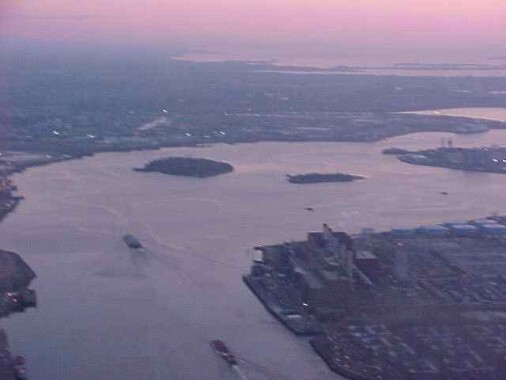 This aerial view shows the Bronx at the top of the picture; North Brother and South Brother island, with Rikers Island to the east of both of them. 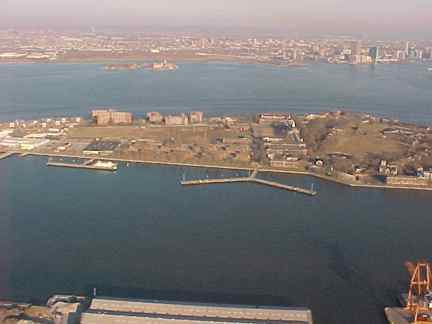 Hunt’s Point, the Bronx, is above Rikers Island. To the south, at the bottom of the picture, is part of Con Ed’s vast Astoria facility. 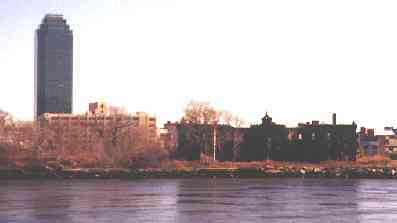 North Brother Island was unused and officially uninhabited until 1885, when Riverside Hospital was moved there from Blackwells (Roosevelt) Island. Victims of infectious and quarantinable diseases like smallpox, typhus and cholera, and later, TB and polio, were detained there. One of North Brother’s most famous detainees was “Typhoid” Mary Mallon, who was exiled to a bungalow on one of the island’s streams. In the 1950s, Riverside Hospital turned its attention to drug addiction and opened a 152-bed rehabilitation center with a huge staff of social workers. Ultimately, though, the program was ineffective, costly and corrupt and Riverside closed for good in 1963. Plan after plan has been proposed for North Brother’s development, but it has been empty except for the rats and birds ever since. Filled with nut trees when the Dutch first settled it in 1624, Governors Island, just south of the tip of Manhattan, had always played a key role in the defense of New York City. The Coast Guard inhabited the island until just a few years ago, and the Army maintained a presence for over a century and a half. After American independence was achieved, it was thought prudent to build two forts on the island. The first, Fort Jay, was built in 1794, and the second (above) was built by Colonel Jonathan Williams in 1811 and bears his name. The British did not attempt to enter New York harbor in the War of 1812 and so neither Castle Williams nor Fort Jay fired a shot in anger during the war. During the Civil War, Governors Island served as an assembly point for volunteers and draftees, as well as a detention era for Rebel POW’s. It also served as a military prison, hospital, supply base and embarkation point for troops during World War I. After the war, there were plans to build an airport on the island, but the idea was later relocated to North Beach in Queens, becoming LaGuardia Airport. The US Army left Governors Island in 1966 after a residency of 172 years. The Army was replaced by the Coast Guard, which stayed until 1997. The island is currently in partial use as a park for the summer. Its housing for military families are planned to be torn down and more of the island will be turned over for recreational activities. Mill Rock, in the East River just east of East 96th Street and west of Astoria, Queens, is in a treacherous area for shipping known as the Hellgate (Dutch for ‘bright passage’). In 1701, John Marsh built a mill there that gave the island its name. 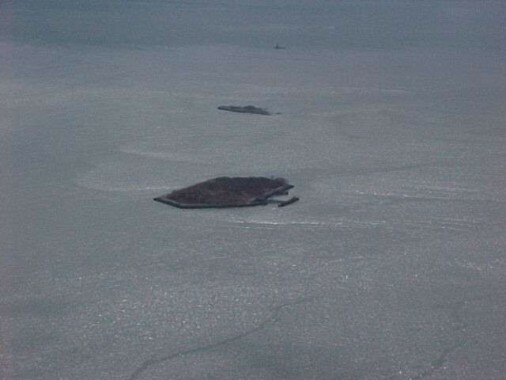 The island was later squatted on by Sandy Gibson, who operated a farm on the island. At that time there were in fact two islands, Great and Little Mill Islands. In 1885 the US Army detonated 300,000 lbs. 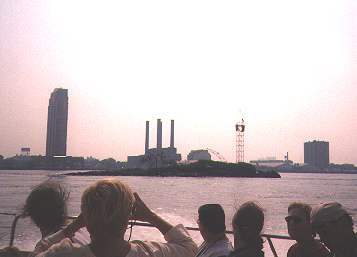 of explosives on adjoining Flood Rock; that island had been the most treacherous impediment to East River shipping. It is most likely the most forceful explosion in NYC history and was felt as far away as Princeton, NJ. The decimated Flood Island was used to fill the space between Great and Little Mill Islands, producing Mill Rock. Between the 1960s and 1980s there were various plans to make Mill Rock a park, but it didn’t work out. Too many rats. Like Roosevelt and North Brother Islands, these two artificial islands off Staten Island’s southeast coast (off South Beach) were used to quarantine infectious patients in the 1800s and early 20th Century. Named for NYC Mayor John Hoffman and Civil War Army surgeon Dr. John Swinburne, the islands were formed from dredged sand in the 1860s. The facilities were closed on both islands by the end of the 1930s. The buildings were gone by the Sixties and the islands have languished since then. Some of the best views of the islands are from Victory Memorial Hospital in Bay Ridge, Brooklyn. You have to be sick to get the views though! 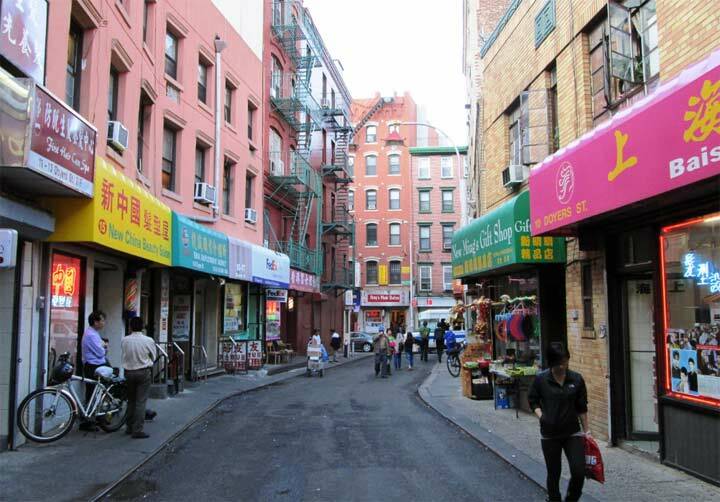 If it weren’t for Belmont Island, there might not be a Flushing Line (#7) subway. The island is made of rocks and soil blasted from a tunnel being built by William Steinway for his trolley line. Later, the tunnel was finished by August Belmont for the fledgling Interboro Rapid Transit subway line. It was renamed in 1976 for U Thant, the UN Secretary General between 1961 and 1971. Aerial photos by Chet Wilson, who showed you traffic jams in the WPIX-11 morning traffic copter that he piloted. HARLEM NOCTURNE. Some extremely old posts in Harlem have survived. Several years ago there was an article in The New York Times about the origin of Woody’s song, “This Land is My Land.” In his hand-written notes, the New York Island was originally Staten Island. Then there are all those islands out in Jamaica Bay….